These old fashioned divinity candy recipes are the first of their kind published. The world's most famous fudge had its origin in the United States in the early 1900s. Divinity is typically a white, sometimes a pastel tinted, meringue-type confection with a light, fluffy texture and a crisp outer layer. It likely got its name from its "divine" taste. Really, it tastes that good! Three cups sugar, one cup Karo corn syrup, three-quarters cup water, three well-beaten whites of eggs, two cups of chopped walnuts, one tablespoon vanilla. Boil first three ingredients until quite brittle in cold water, then pour slowly and gradually into the eggs and beat until it stiffens. Add vanilla and nuts and pour onto a buttered platter. When cold cut in squares. One and one-half cups granulated sugar, one-half cup Karo corn syrup, one-fourth cup water, white of one egg, one-half cup chopped nuts, one-fourth teaspoon vanilla. Boil sugar, syrup, and water to soft ball stage. Take out one cup and fold into stiffly beaten white of egg. Add vanilla and nuts. Allow rest of syrup to reach crack stage and stir that into egg mixture. Put in pan or allow to cool until it will stand alone, then drop by spoonfuls on buttered paper. Two and one-half cups granulated sugar, one-half cup Karo corn syrup, one-half cup hot water, whites of two eggs, one-half cup nuts, flavoring. Cook sugar, corn syrup, and water in a 2-quart pot over low heat, stirring constantly, until sugar is dissolved. (On very humid days, use 1 tablespoon less water.) Cook, without stirring, to 260°F on candy thermometer (or hard ball stage). Beat egg whites in 1-1/2 quart bowl until stiff peaks form. Continue to beat while pouring hot syrup in a thin stream into egg whites. Add vanilla; beat until mixture holds its shape and becomes slightly dull. (Mixture becomes very stiff.) Fold in nuts, if you choose. Drop from buttered spoon onto waxed paper. Let stand at room temperature, turning candy over once, until surface of candy is firm — allow at least 12 hours. Store in airtight container. Makes about 4 dozen candies. This Divinity is easy to make with NO egg whites and NO thermometer. Powdered, dry frosting mix is difficult to find, but packages are available in many food stores. Line a 10x15-inch cookie sheet with parchment or waxed paper. Set aside. Beat frosting mix, corn syrup, vanilla, and boiling water in a mixing bowl until stiff peaks form, about 5 minutes. Mixture will be very thick, and it is helpful to use a stand mixer. Transfer mixture to a large bowl and gradually beat in sugar; stir in nuts. Drop mixture by teaspoonfuls onto lined pan. Let stand about 4 hours or until firm. Turn candies over and dry at least 12 hours. Store in an airtight container. Makes about 5 dozen or so pieces. 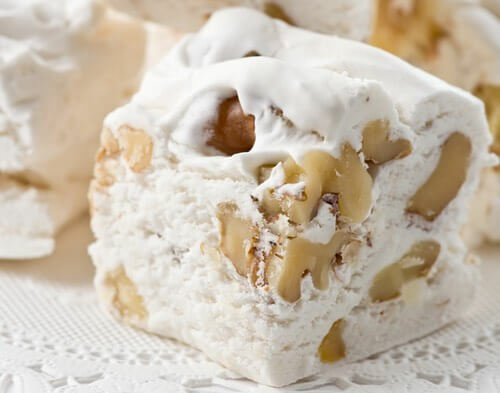 This is a Divinity candy recipe without egg whites that's easy to make using marshmallow creme. In a large heavy saucepan, stir together the water and sugar. Bring to a boil, and heat to between 234 and 240°F (112 to 116°C), or until a small amount of syrup dropped into cold water forms a soft ball that flattens when removed from the water and placed on a flat surface. Remove from the heat, and stir in the marshmallow creme, vanilla, food coloring, and pecans. Let the mixture sit for about 5 minutes until slightly cooled and thickened. Drop by spoonfuls onto waxed paper. Chill until firm before storing in an airtight container. Makes about 2 dozen candies. The marshmallow creme called for in the vintage candy recipe is an easily spreadable marshmallow-based confection that originated as a filling for layer cakes. The first cookbook to feature its recipe was Fannie Farmer's "Boston Cooking-School Cook Book" in 1895. "Mrs. Rorer's New Cook Book" had a similar marshmallow filling recipe seven years later, in 1902. 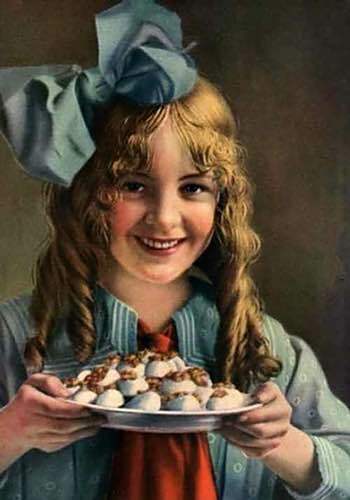 Commercial versions of the confection were first sold in the early 1900s, and today the product is available for purchase throughout North America and in many European Union supermarkets. Brands include Solo® Marshmallow Creme, Kraft® Jet-Puffed Marshmallow Creme, and Marshmallow Fluff® manufactured by Durkee Mower Inc. A popular vegan equivalent is Suzanne's Ricemellow® Creme. To make your own, visit my Old Time Icing page for recipes. For divinity to harden properly, it's always best to make it on a day that's not too humid. Finish beating the divinity mixture, then work quickly to pour or drop the mixture onto a buttered platter or waxed paper, since it is quick to harden. Add several drops of water if the divinity mixture becomes too thick. Continue beating if the mixture remains too thin. It is best to store your candies in an airtight container until ready for serving. Some experimentation can be expected if you are inexperienced in making divinity, since misjudging its cooking time can greatly affect the results. Undercooking can leave divinity too soft whereas overcooking can leave it too hard. The old fashioned divinity candy recipes above say to pour the cooked candy mixture on a buttered platter for cutting into squares. However, recipes published later on began to call for pouring or dropping the mixture by spoonfuls onto waxed paper for cooling. So, squares or drops, it's your choice. Both are delicious!